Ambrose Alli University (AAU) Ekpoma Departmental Cut-Off Marks/Points for 2018/2019 Admission Exercise Published Online. 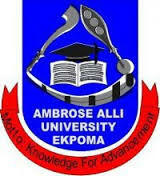 The University Management has approved the Cut-Off Marks for the 2018/2019 admission exercise of Ambrose Alli University (AAU) Ekpoma. This is for the guidance of all Stakeholders!! !